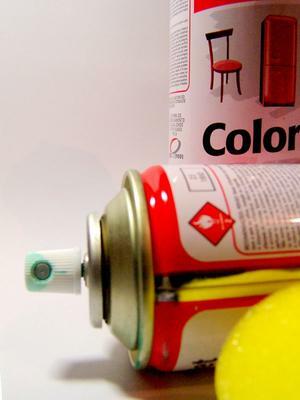 Decorating with a can of spray paint is an inexpensive alternative to purchasing new furniture and accessories. Spray paint can be found in almost any color and finish which makes it the perfect paint for a quick project. Add life to old patio furniture, mailboxes and accessories with the simple ideas below. If the mailbox is beginning to show the signs of age, breathe new life into it with a fresh coat of paint. Sand the box lightly with fine grain sand paper and wipe down with a damp cloth. After the mailbox has completely dried, place a few sheets of newspaper on the ground around it and begin to paint. Spray paint from the top down in even, light sweeps. If too much paint is applied it will drip and run. It is always better to apply a second coat than applying too much during the first coat. Of course, you’ll want to remove the mailbox from the house before painting it. Steel doors can also be spray painted to match the mailbox, shutters or to create a focal point for the house. As with the mailbox, be sure that the spray paint is applied in consistently and evenly. Make sure that the door remains open until it is completely dry or it will stick to the door frame. Patio furniture and outdoor accessories can have a brand new look with a can of spray paint and a little time. Lightly sand the surfaces to prepare them for the spray paint before starting to paint. Plastic surfaces, such as plastic chairs and tables, can also be spray painted with special paint designed just for plastic. Allow the furniture to dry completely before using it. Spray paint is also a great way to transform plain aluminum buckets into colorful planters or a handful of river rocks into a patriotic center piece. Play around with the colors and finishes available to create fun pieces that will accent the decor without costing a lot of money. For a more practical use, consider spray painting the house number on trash cans and recycle tubs to make sure they get back where they belong if they blow away. Large pieces of foam board are excellent for creating spray painted wall decor. Use complimentary colors, monotones or a single color to spray paint a modern design on the board before hanging it on the wall. It is inexpensive, colorful and large enough to create a focal point in any room. Picture frames, mirror frames and other wall art that has lost its luster can all benefit from a colorful coat of spray paint. Some materials may need a coat of spray primer before the paint is applied. Spray paint primer can usually be found next to the spray paint displays and it is worth taking the time to apply it. When painting with spray paint, be sure to use a paint mask and gloves. Wearing old painting clothes will help keep the paint from getting on clothes and make for easier clean-up. Cheap plastic tablecloths are also good to use as ground cover, as they cover a relatively large area and can be thrown away after use. Decorating with a can of spray paint is a quick, inexpensive way to make old things new and recycle pieces that are already in the home.